Launched in 2002 Avie are a most enterprising record company who operate their label for and on behalf of the musicians who retain ownership and copyright of their recordings. For this recording Avie have assembled three core examples of mainstream Romantic Violin Sonatas all composed within thirty-five years of each other. Avie are to be congratulated for continuing to demonstrate their commitment to younger performers by spotlighting the talents of Albanian born Rudens Turku, who plays the 1750 Januarius Gagliano violin, and Ukrainian born pianist Milana Chernyavska. While on vacation at Hofstetten, close to the Swiss holiday resort of Lake Thun during August 1886, Brahms found himself refreshed and musically invigorated such that he proclaimed the resort to be "so full of melodies that one has to be careful not to step on any." In fact, during his time there Brahms composed most of his three best loved chamber works in just a matter of days; the Second Cello Sonata Op.99, the Violin Sonata No. 2 �Thun� and the great C minor Piano Trio Op. 101. The Violin Sonata is sometimes described as the Prize Song Sonata as a result of the main theme of the first movement resembling a brief few notes from the �Prize Song� from Wagner�s Opera Die Meistersinger von Nürnberg. The three movement work is both the shortest and the most immediately appealing of Brahms� three violin sonatas. Not for a single moment is the radiant, joyful mood ever put in real jeopardy and the melodies are of the long-spun, heart-warming variety that are particularly memorable and pleasing on the ear. Turku displays fine playing throughout controlling the idyllic nature of the score expertly without any sign of self-indulgence. In the compact and straightforward opening allegro amabile his playing is expressive and unsentimental with Chernyavska�s impressive keyboard colour. The second movement andante tranqillo - vivace is a fusion of a slow movement and a scherzo and the duo offer a blend both vivacious and tender. I especially enjoyed the infectious lyric quality to the playing in the final rondo movement marked allegretto grazioso. My first choice recommendation in the Second Sonata is the greatly admired account by Josef Suk and Julius Katchen on Decca 421 092-2. Alternatively the far lesser known but equally impressive interpretation by Nils-Erik Sparf and Elisabeth Westenholz on BIS-CD-212 has delighted a enthusiastic group of admirers. Other fine accounts are available from Pinchas Zukerman and Daniel Barenboim on Deutsche Grammophon DG 289 453 121-2 and Shlomo Mintz and Itamar Golan on Avie AV2057. Schumann believed that the city of Düsseldorf had not been not kind to him. Although he was initially welcomed to the city with a great fanfare it was not long before events turned sour. His fragile mental health and indifferent conducting ensured that he was soon relieved of his post as Municipal Musical Director with the suggestion that he concentrate his creative energies on composing. In spite of the significant difficulties that Schumann experienced during his tenure there he enjoyed substantial periods of remarkable musical inspiration. Nearly a third of his compositions were written during his four year period in the city. Schumann�s two Violin Sonatas were both composed in 1851 and in neither work does he choose fully to exploit the technical possibilities of the violin preferring to use the instrument at its most expressive. Clearly mirroring the composer�s state of mind at that time the two works in their minor keys give the music a sense of uncertainty and tension, a grave sombre disharmony and a disquieting state of unresolved strain. Equally unmistakable is their mood of negative introspection and the subdued and fatalistic tone. The violin speaks almost entirely from the middle register with few opportunities for virtuosity and little in the way of pizzicato and tremolo effects. In fact, the two works were described by biographer Philipp Spitta as, "... gloomy, impassioned compositions, which can hardly be listened to without a feeling of oppression." The three movement A minor Violin Sonata No. 1 has an impressive opening movement with a passionately expressive theme played first in the lower register of the violin, from which the rest of the extended movement develops. Turku and Chernyavska are highly impressive in this opening movement and play as if their lives depended on it. There is warm and expressive playing from the duo in the central movement allegretto which is actually a pleasant intermezzo taken at a brisk pace, somewhere between a slow movement and a scherzo, in the form of a rondo. The sonata-form finale resumes with the restless mood of the opening movement, although the level of tension is heightened by the music�s faster tempo and tightly packed textures. The Sonata ends determinedly with agitated cadential gestures that reaffirm the score�s pervasive anxious mood. Turku and Chernyavska play this closing movement as to the manner born in a thrilling and highly driven interpretation. This is a wonderful performance that rightly becomes one of the leading accounts. A favourite version of the Schumann Sonata Op. 105 is from the eminent partnership of Gidon Kremer and Martha Argerich on Deutsche Grammophon 419 235-2. In addition, I would not wish to be without the account from Anthony Marwood and Susan Tomes on Hyperion CDA67180. The Violin Sonata in A major composed by Belgium born composer César Franck in 1886 is a war-horse in chamber music repertoire and remains a hard nut to crack for performers. Composed as a wedding present for his friend and fellow-countryman, the violin virtuoso Eugene Ysaÿe, the four movement sonata is an epic work and is regarded by many as the finest violin sonata in all French music. Personally, I would go so far as to say that the score, which is so fresh and packed with original character, has worthy claims to be the finest violin sonata ever written; certainly in the Romantic repertoire. It is a work that runs the gamut of emotions from unbridled passion to sublime serenity and successfully employs cyclical themes. The violin soars over the piano part with the most uplifting of melodies. The complex and delightful echoing finale, with the violin and piano voices playing off each other, is justly famous. In the dreamy first movement allegretto ben moderato I was particularly impressed by the way Turku and Chernyavska expertly contrast the contemplative mood with the underlying element of tension. The duo are expressive and compelling in the turbulent second movement allegro. The noble recitative-fantasia is ravishingly given with a passionately Romantic interpretation of the youthful gaiety of the final movement allegretto poco mosso. This is wonderful playing from Turku and Chernyavska in what is a most enjoyable and desirable account. 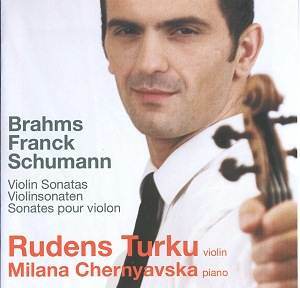 Franck�s A major Violin Sonata is an often recorded work and the catalogues contain numerous fine versions. The celebrated recording from Kyung Wha Chung and Radu Lupu is a confident recommendation on Decca 460 006-2. I am also extremely fond of the account from Sarah Chang and Lars Vogt on EMI Classics 5 57679 2. The playing on this release from Turku and Chernyavska is never self-indulgent or showy. Their sensitive and thoughtful approach blends well with episodes of considerable vitality and high enthusiasm. Turku does not play with the robustness or possess the weight of tone of some performers, which is especially noticeable in the Brahms work. However, Turku�s perceptive and affectionate approach soon becomes extremely endearing. Well done Turku and Chernyavska, and congratulations to Avie for an excellent release.